The Meroe Visitor Center will be the gateway to the archaeological sites of the UNESCO World Heritage Site of the Island of Meroe and to the archaeological heritage of ancient Sudan. Tourists arriving at Meroe, Musawwarat, or Naga will be given the information they will need to appreciate and understand this World Heritage Site, which is now rarely visited, as well as the nearby communities, and the surrounding environment that is dominated by the Nile River. Between the mid-3rd century BCE and the mid-4th century CE, the Island of Meroe region was the center of power of the Kingdom of Kush, an important polity that had arisen in ancient Sudan during the 8th century BCE. The Kingdom had political and economic ties with the vast African continent to the south, with the Mediterranean World, and with Egypt, the Ancient Near East, and the Far East. The UNESCO World Heritage Site of the Island of Meroe is comprised of three distinct areas: the capital city of Meroe (which itself consists of an ancient town with temples, palaces, and necropoleis with scores of pyramids) and the settlements and religious centers at Musawwarat es-Sufra and Naga situated away from the Nile. In addition to providing information about the three settlements of the Island of Meroe, the Visitor Center will also contain interpretive panels about other important Sudanese sites such as Hamadab, Abu Erteila, Berber, Dangeil, Wad Ben Naga, Mouweis, and Awlib. The Meroe Visitor Center is supported by the Qatar-Sudan Archaeological Project (QSAP) and by the National Corporation for Antiquities and Museums (NCAM). 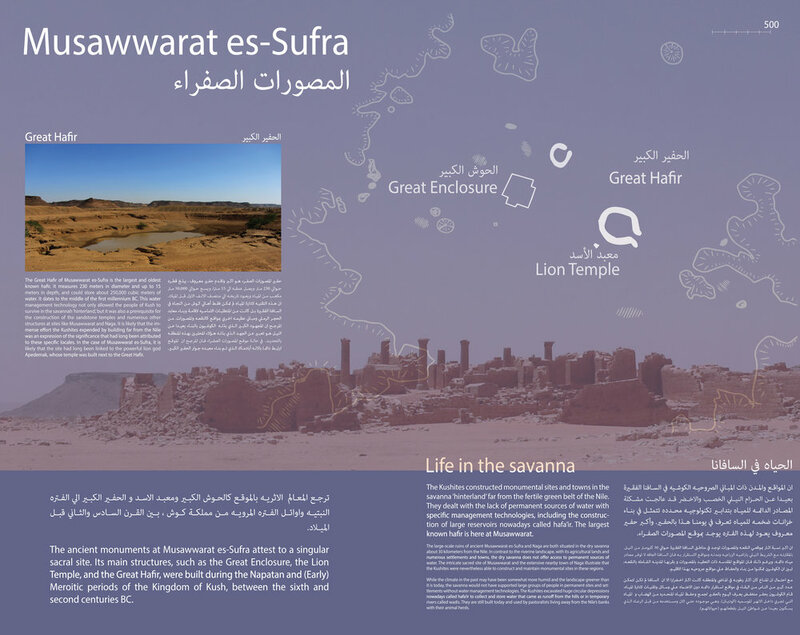 Interpretive panels are being created by an international team comprised of scholars, heritage managers, and stakeholders based in Sudan, Germany, and in the United States, in coordination with the German Embassy and the United States Embassy in Sudan. The Visitor Center is scheduled to open in the Fall of 2018.